The Asus Transformer Prime has several “firsts” for 2012. It’s the first tablet to come with Google’s(s goog) new Android 4.0 software, designed to unify phones and tablets. And it’s the first tablet to run on a quad-core chip from Nvidia(s nvda), dubbed the Tegra 3. So does first equal best? Not in every case, but in this particular instance, I’m comfortable in saying that the $499 Transformer Prime is currently the best large Android tablet you can buy. The Transformer Prime with 32 GB of storage is the second iteration of Asus’ popular 10.1-inch tablet which debuted last year. And the reason for the “Transformer” name is due to the optional $150 keyboard dock, but more on that in a minute. The slate itself uses a high-quality IPS display at 1280 x 800 resolution. It’s clear and bright from all angles. There’s also a handy option to bump up the brightness for outdoor use: The screen jumps to 600 nits vs. the iPad 2’s 380 to 400 nits, so it’s nearly 50 percent brighter with this setting. At 8.6 millimeters thick and 586 grams, the Prime is easy to tote and hold, especially with the large bezel around the display; roughly one inch.There’s a 1.2 megapixel front camera which worked fine in my video chat tests. However, the camera is offset, so I had to tilt the tablet to appear centered in my calls. The rear camera is 8 megapixels (with LED flash) and takes adequate, but not stellar images. Video capture is supported up to 1080p and video looks soft around the edges but still good. Other ports and buttons include a 3.5 millimeter headphone jack, a single speaker, two microphone ports, up and down volume rocker, microSD card slot and micro HDMI port to connect the device to an HDTV or digital monitor. This last port works well and the tablet is more than capable for displaying high resolution videos or games on a second screen. The power button is very small and can be hard to find; a problem when waking the Prime up from sleep mode. GPS, Wi-Fi, Bluetooth are all standard; there is no version available with mobile broadband. About that dock: With it, the thin slate connects to a full keyboard and trackpad, morphing the device into an Android-powered notebook of sorts. In addition to the easier input method, the dock adds a full-sized USB port and SD memory card slot. There’s also dedicated Home and Back buttons that support Android. Plus the dock has its own battery, which adds another 6 or so hours of runtime to the Transformer Prime. On its own, the Prime can easily power through a day. I’ve been able to use it as a primary device for a solid 11 hours with juice to spare. So with the dock, this becomes an 18 hour configuration. On the downside, the dock weighs less than the slate, so the Prime can tip over if not careful. The keyboard isn’t backlit and the trackpad needs improving as well. It often became frustrating to use when not responding the way I had swiped. You can use two fingers to swipe up or down for browsing or navigating home screens, which is handy. Google’s new Android 4.0 software, or Ice Cream Sandwich, is similar to the prior iteration, but much improved. The user interface is cleaner more consistent than before, but not radically changed in terms of general navigation. Android widgets are more interactive and Asus even added some of its own to help with battery monitoring, email and task management. Also customized by Asus is the one-touch Settings display, making it easy to enable or turn off radios or use one of three tablet modes: Power Saving, Balanced and Performance mode; each of which throttle the CPU up or down for optimal use. As mentioned, the CPU is Nvidia’s 1.3 GHz quad-core Tegra 3, which also has a fifth, low-power computing core as well as 12 graphics cores. Overall performance shines with Tegra 3, especially when playing games optimized for the Tegra 3. Here’s a video look at how the Prime handles console quality games along with an Xbox 360 controller, which is supported by the dock’s USB port. For nearly every task the Prime keeps Android apps moving quickly. But don’t set your expectations too high simply because of the multiple processing cores. The tablet is fast, but not all apps are optimized to tap the full power of a quad-core chip. Given that developers haven’t yet optimized many of their apps for Android tablets in the past year, this could take time. Still, even with today’s apps, the Prime offers the best software experience available today on a Google-powered tablet. In addition to the core Android 4.0 apps and those in the Android Market, Asus has added some of its own. SuperNote is a simple simple way to capture and ink notes with a finger. MyCloud offers access to cloud storage for media or documents or can be used to remotely connect to a PC or Mac. And Asus partnered with Infraware to include Polaris Office; a productivity suite that really shines with the keyboard dock. If you’re in the market for a large Android tablet, the Transformer Prime is a must-see. At this price, it clearly competes with Apple’s (s aapl) iPad 2, but offers 32 GB of internal storage plus the ability to expand. While the trackpad is lacking on the optional dock, it’s worth the extra cost for both the extra battery life, keyboard input and USB port if you need these features. Essentially, you end up with a netbook-style form factor that runs all day on a charge and can be used as a standalone tablet. But even on its own, the Transformer Prime is a powerhouse with an experience exceeding its peers thanks to Android 4.0 and the Tegra 3 processor. If I were in the market for a large Android tablet, this device would be atop my list. Kevin, I read hundred of reviews on the asus transformer prime and yours is by far the best. Your the only one who actually mentionthat the power button is small and it can be a problem wakeing up the tablet. This is a sore point for me, coming from iPad with home button, I find that I can only wake up the primme using this small power button which I have a feeling it will not last very long at this rate. Can someone recommends anything to wake up the prime without pressing the power button? many thanks Kevin. for those whose history with tech only goes back a few years the transformer prime, tf201 may not seem like such a big deal but for the rest of us, those who started out with monster pc boxes that used dos and your dialup modem literally was a box you placed your telephone handset into,…the world and our devices has changed so fast it is nothing short of amazing. the transformer prime is part of the next wave of devices and as it is most certainly breaking new ground. none should be surprised though that there have been a few bumps along the way, there always have been, always will be with new tech. i have a desktop and notebook running on win7 ult as well as a gen 1 ipad and a 2 gen iphone, this is my first android device and i haven’t had this much fun with a new device in a very very long time. if you get your hands on one now count yourself as lucky not only will you have an incredible device but you got one after the early, first edition adopters worked the bugs out so to speak. I have a Fire and an iPad2. Have used Galaxy Tabs both 7 and 10. For the over-all experience, the Prime beats ’em hands-down. I’ve had my Transformer Prime for about 3 weeks & absolutely love it. By using my EVO 3D as a Hotspot I’m able to get connected virtually anywhere. I agree with your review and highly recommend it. It is very close to completely replacing my PC. The only thing that is holding it back from replacing my PC entirely is waiting for App Developers to optimize their programs for ICS & all of the incredible features you listed, but I’m confident that will come in time as the developers recognize the shift to Tablet Devices that is taking place at a very fast pace. I am especially looking forward to an Office Suite that fills the bill for day to day work situations… Than the transformation will be complete. I recieved my prime yesterday, the only gripe I have with it is that I need to press power button to wake the prime up from sleep, is there any other solution to this like tapping the screen for example? at this rate, the power button is not going to last long. Many thanks. I’vd been drooling over this device but it’s been sold out for months at Best Buy. Hopefully they re-stock soon! 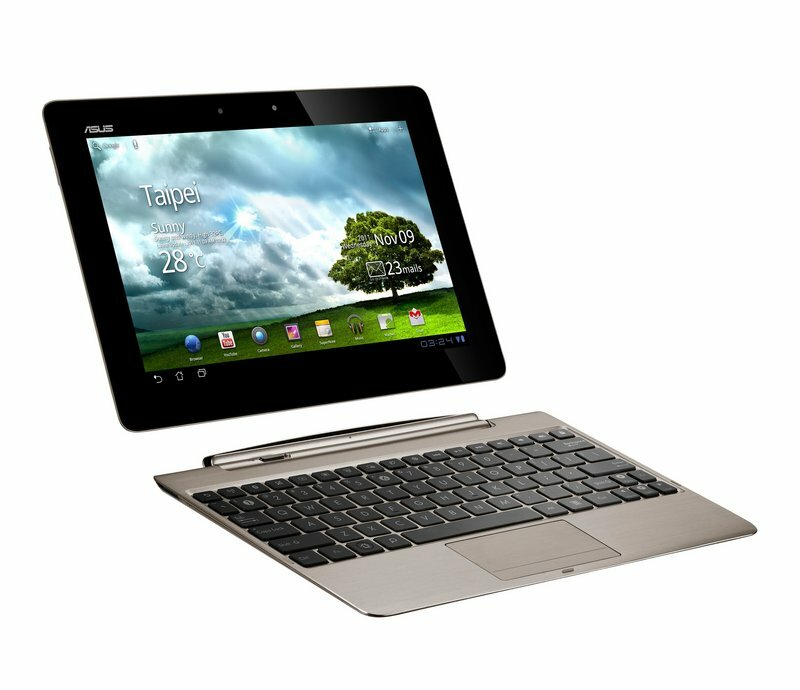 I like the idea of the Asus Transformer Prime, but I doubt I’ll be buying one. I don’t want to have a work computer, a home computer, a smartphone, a kindle, and a tablet. These need to be consolidated. My recommendation is that Asus and other companies continue to innovate on this type of design, but work on making shells which can operate across these devices…insert the phone into a tablet shell, and you are good to go…insert it into a work/home computer and good to go…the other issue is that the speed/performance/graphics that are needed for these sort of devices can’t be achieved in the tablet/smartphone size at a reasonable price, so I’d recommend having the smarts (e.g. cpu, video) in the shell, and for the internal unit processing power to take a backseat when placed in a shell…but maybe I’m just dreaming? of units. Consolidation is a dirty word! I’ll keep on waiting. I’ve already got the Galaxy Tab 10.1 (WiFi), Xoom (LTE), and the Galaxy Nexus LTE Phones. As much as I’d like to add the transformer to this list and get the quad core goodness and keyboard dock, I’ll hold off until the next generation screens come out. The retina type displays with quad core goodness should make for a truly awesome tablet. The Prime is not just the best Android tablet, it’s the best tablet in the market – surpassing the iPad in every respect by several notches. By the time the iPad3 is released, it will be competing with the 700 series of the Prime. Great Review – I’m buying Asus Transformer Prime! Thanks. I like the keyboard feature. I don’t enjoy typing on a screen but don’t mind navigating with touch screen. This gives me best of both. What? They release a tablet with no mobile data (3G) in 2012? Sorry, but #Fail. The whole 3G & 4G phenomenon is so over hyped. Depending on your carrier, where your at, weather conditions, solar flares, and removal of mattress labels, they’re both so inconsistent for anyone to really rely on using them for critical usage. Free wifi has become more and more easy to gain access to. Most folks are generally using their tablets in a stationary location anyhow. Besides, all the carriers are banging people hard for those data plans, its ridiculous. it is called the tf202,…already being released in s.e. asian markets. sometimes i forget it isn’t just adults communicating in these threads but also kids who still have much to learn. so take their responses with a grain of salt so to speak. Hi there. I ordered the Prime today and found all this info you posted. Well done! Thank you for the work you did. Hi there. I ordered the Prime today and read and saw your reports and I wanted to say thank you for making all this info available to me. Well done. Can’t wait!!! I agree to you Kevin, Transformer Price is the best tablet in this price segment however I feel we can not come to any conclusion until its used by masses. There are many tablet PC available in the market and they all are coming up with best features and OS so it will be too early to declare this as the best tablet PC.